There was a little frost on the pumpkin this morning. (Seriously. My pumpkin is still on my stoop. Don’t judge. It’s cute and it hasn’t fallen in on itself yet.) It was frosty enough for the (gasp) scraper on the car windshield. Frosty weather is perfect for a little pip. Ya know? Pip Robins. Pip Robins is a logical choice when the weather cools off. 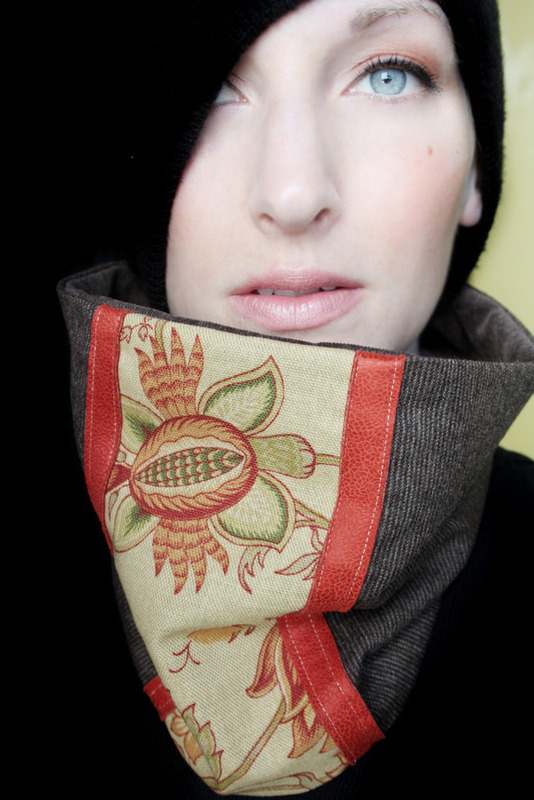 Designer and creator Gillian Hyde has been making and perfecting her cowls here in Halifax since 2009. After seeing a fella struggle against the wind with a bandana to keep warm, the tubular, over-the-head accessory was born. 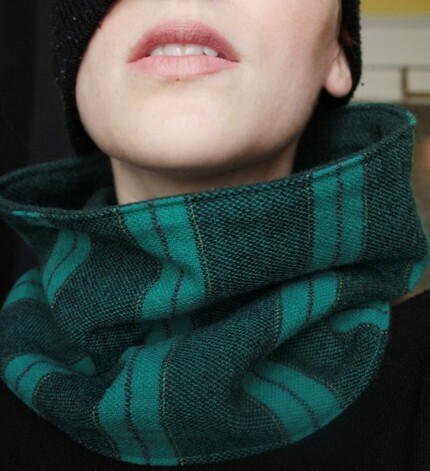 The Pip Robins line has grown from her signature unisex plaid cowls to include unique, limited edition appliqued varieties as well as lace and embellished flowers. Gillian takes care to choose sustainable fabrics (often recycled) wherever possible and has a variety of choices from a cozy plaid and hardy herringbones to romantic lace and pretty satin flowers. 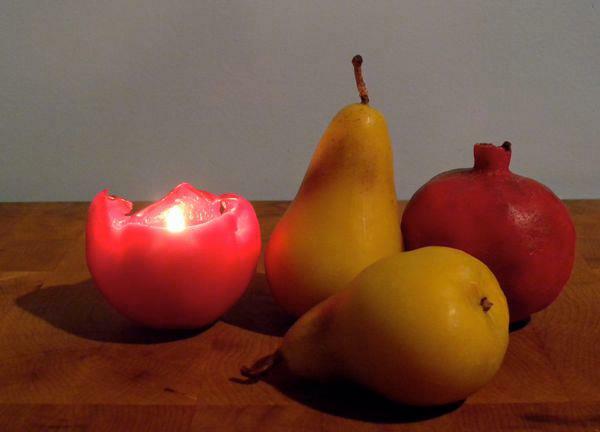 Now – don’t those look cozy?? 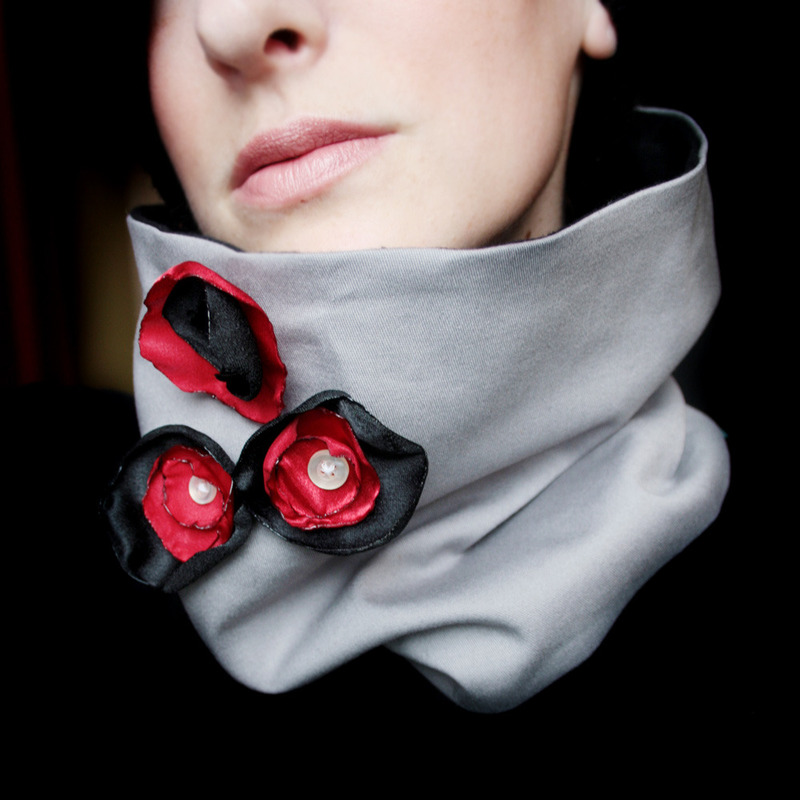 And easy to wear! Come on in and see for yourself. Another successful Nocturne event has now come and gone. Love, Me closed for the evening and instead left a big box of chalk out to encourage people to chalk love letters to the city & general messages of silliness throughout the evening. When I left to go off and explore some of the projects, there was already some fun additions to our sidewalk and down our street. 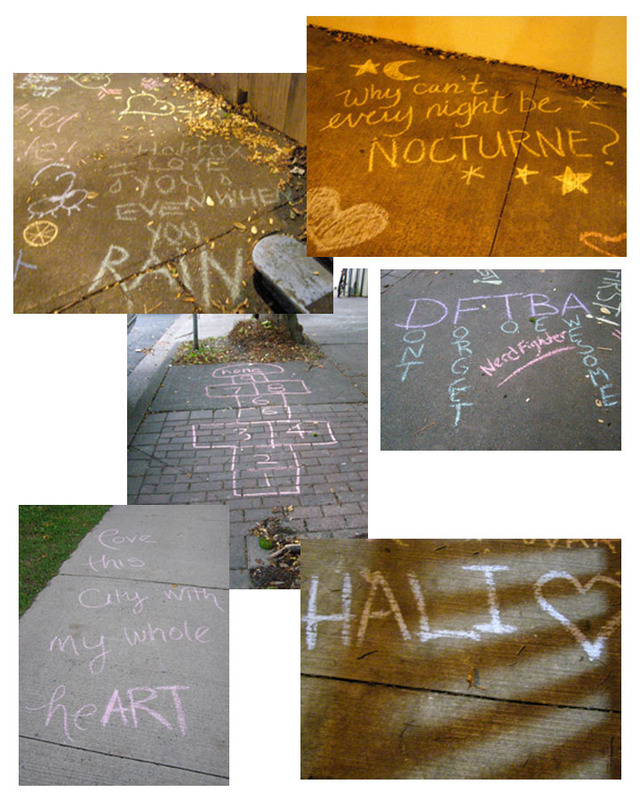 When I returned at the end of the night, my small block had turned into a beautiful colourful chalk wonderland! The few streetlights and store window lights shone down on a rainbow of drawings and messages (including a proposal!) My only wish is that I could have come back the next day to see the smiles on peoples faces as they discovered our colourful happy Birmingham Street. I was very thankful to have the opportunity to get out and see some projects this year (outside my own zone and without the pressure to get back in 15 minutes). I was blown away by the varied, amazing projects and the electric atmosphere. My hightlights? Talking to China with the Remote Corners project, the NSCAD students large scale pottery pieces lit and smoking in front of the waterfront campus, the Phantom Limb architecture hauntingly blowing in the wind, Happy Wash, the buzzing honey bee treestump piece, being transported to a Kabul market outside the AGNS, and making berry baskets. It was such a great night. I am so happy Halifax has embraced this amazing event and can’t wait until next year. 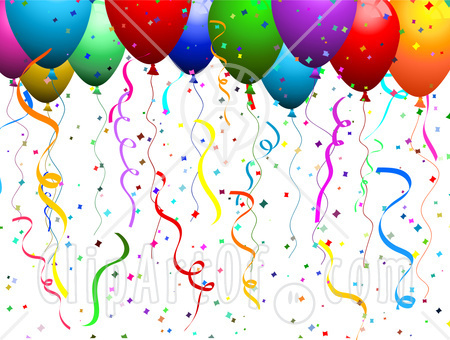 Before I announce the winners to our 1234 Birthday Contest, I want to thank you all for commenting, posting, tweeting, liking, signing up, and just loving up Love, Me in general. And… Now…(that is said in the most perfect deep & smooth announcer voice imaginable BTW) to announce the winners. The Newsletter Subscriber who won the draw: Ceilidh S.
Each winner won four ten dollar Love, Me Dollars – one for them to use and three others so they can spread the love around to friends. Yah to spreading the love. The winnings are to be picked up in person during the store’s open hours and are not redeemable for cash, can not be used for tax, and will induce a mild spread of happy that could be contagious. Winners can pick up their prizes anytime after this Friday, October 21 (2011). My big old maple in the backyard is showing off some hues of red. Just in time for the flipping of the calendar to October. Whoa! This weekend is Thanksgiving. Hang on, that is worth another WHOA! Are you ready? 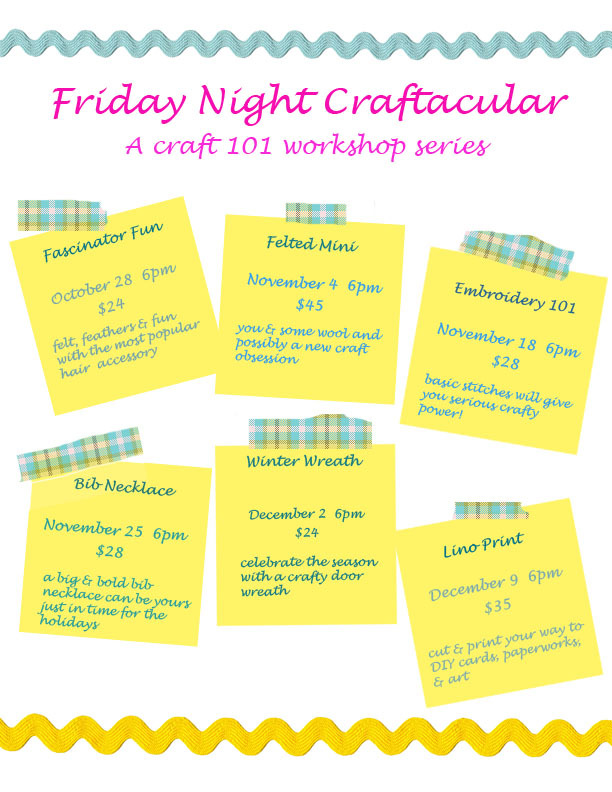 Are you ready to begin the season of cozy company and holiday entertaining? 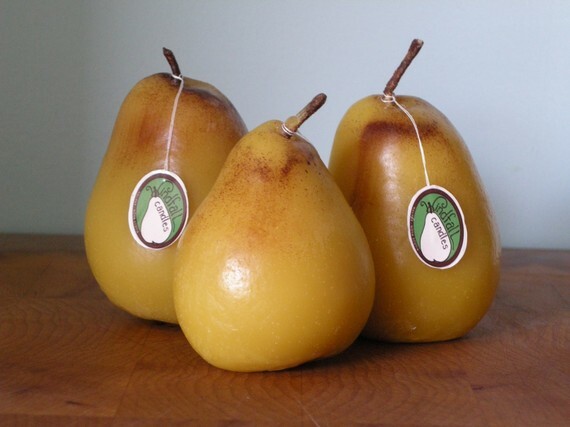 These beautiful locally crafted beeswax pear and pomegranate candles are a perfectly thoughtful offering for a fall invite. They are so gorgeous that they would please any host. And perfect for our hurricane and snow storm prone weather. 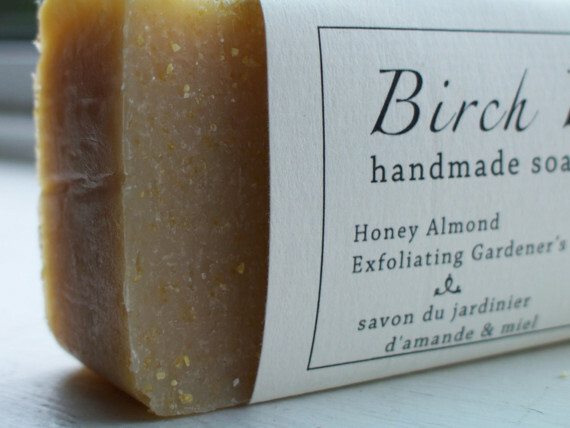 Birch Bark’s 100% natural, 100% handmade soaps from Yarmouth, NS are a simple and gorgeous offering to any host. 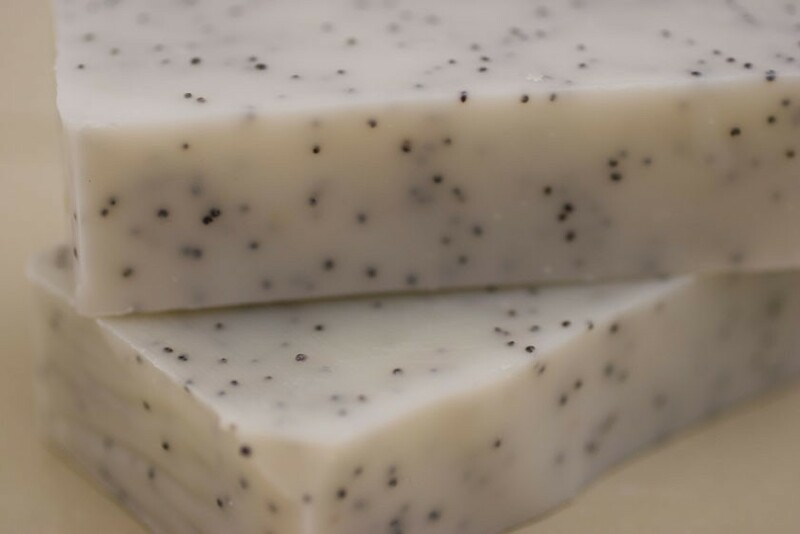 The scents of Organic Carrot, Chai Tea, Rosemary Mint, and Orange Vanilla are so delicious that even if you end up with a Griswald turkey, you could probably snack on the soap to keep you sustained. We also carry locally crafted wire & vintage button flowers to offer to a scent sensitive host. And what about for those kiddos? If your host has kids, something for the kids to-do is a really thoughtful (and appreciated) gesture. Love, Me has a fun collage kit for kids that can keep those kidlets out of their parent/s hair while they are serving up drinks, appetizers, and finishing off the meal. And if conversation begins to dwindle, you could join in the collage making. We have plenty more ideas up our sleeve. Pop by on your lunch hour. We are open until 7 pm on Friday night and Saturday 10-5:30 if weekdays are too much of a squeeze. Come on by. Let us solve your hostess dilemmas. We can talk turkey. Basically, we want to be your best friend. We have a few programming tricks up our sleeve and some cool new products en route. Stop by anytime for a visit. 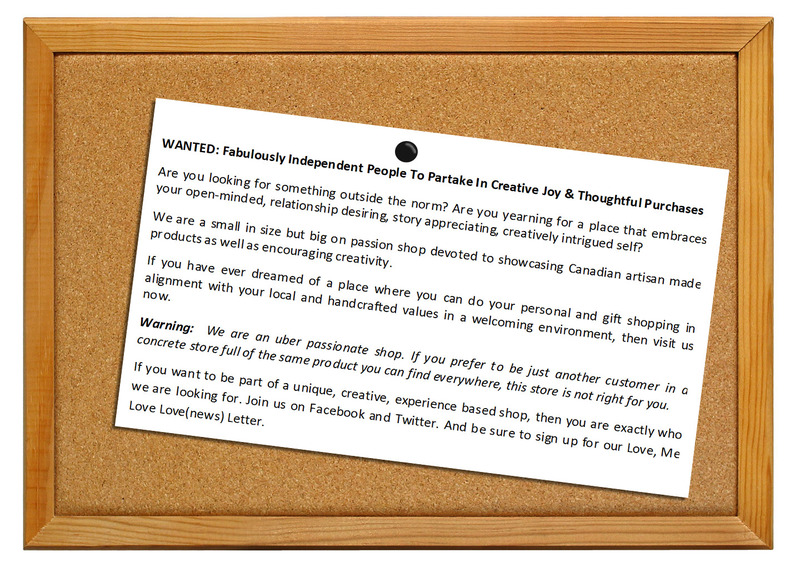 Feel free to also send me an email (lovemeboutique@eastlink.ca) telling me what you want and need from me. Or you can also just write me a nice note. I like notes. I can fix all your problems. Well, a lot of them. 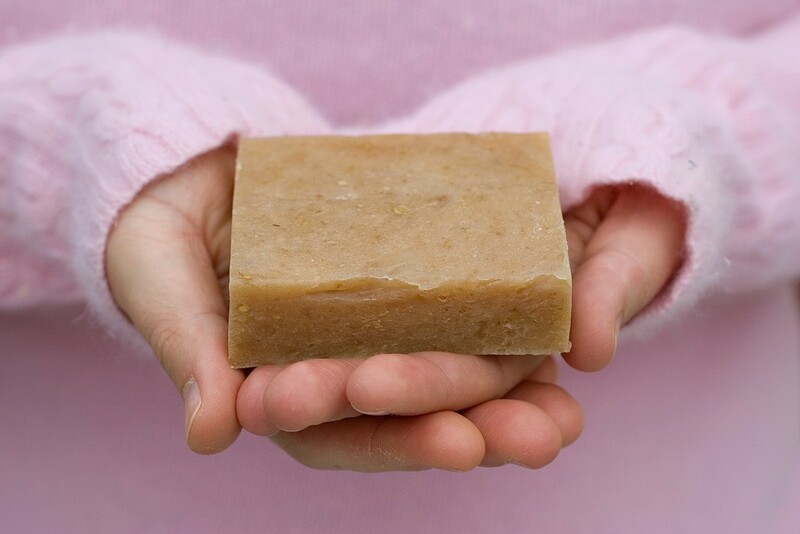 Especially this one: “I need a gift for …. and he/she has EVERYTHING.” Love, Me Boutique’s solution also works for any invitation which reads: “don’t bring gifts”. Or for when you are dreading finding yet another gift for yet another kid birthday party. The Love, Me solution is about giving you a gift that meets your criteria for unique, fun, cost effective (read under $20), and best of all – effortless. Fixing all your gift giving problems in a timely, affordable, and super rockin’ way since 2011 – Love, Me’s Birthday Surprise Ball! If Surprise Ball sounds familiar, it is because we created and launched them last year for the holiday season. And they were a hit. So we created a birthday themed ball to have in our shops year round. Filled with super fun (& sweet!) colourful surprises as well as some traditional birthday goodies, the surprise ball is both a fun gift and a silly, happy experience. Unwrapping the layers of paper reveals surprise after surprise. You probably want to know what is inside the balls, don’t you? Well if I told you, it wouldn’t be a surprise. 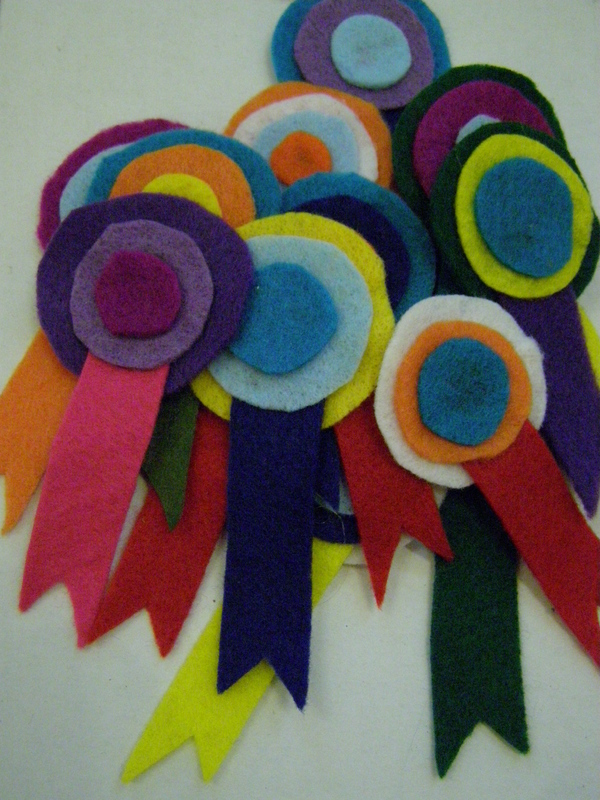 I will share a picture with you of one item found in every ball – a birthday badge of honour handmade by me with some delightfully coloured felt. And because this is the gift that keeps on giving, our surprise balls are wrapped in pretty layers of paper strips which can then be used to decorate the birthday party space or used to create more fun. I recently gave some Surprise Balls to the kids of a friend of mine and as soon as the ball was finished and all sugar was consumed, they got to work making themselves capes, Rapunzel braids, and colourful animal tails with their wrappings. So fun. Oh! Here is the effortless part – it is already wrapped. Toss that ball off to the intended and let the hootenanny begin! So next time you run out of time, ideas, or dollars for a birthday gift, stop by the shop and pick up a Surprise!! !